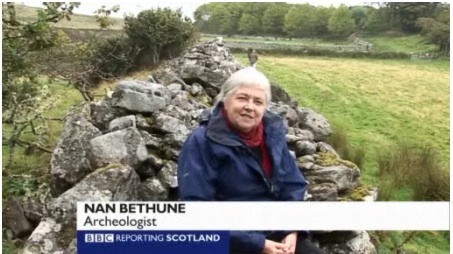 One of the early recorded sites for our Henderson family is a place named Rhian, that is south of Dunbeath, and the ruins of some of the structures still stand today. In the late 1700’s, the Sinclair landowners of the Berriedale and Dunbeath estates had decided to change the way their land was being used. Up to this point, small parcels of land were leased to farmers to grow food and raise livestock. 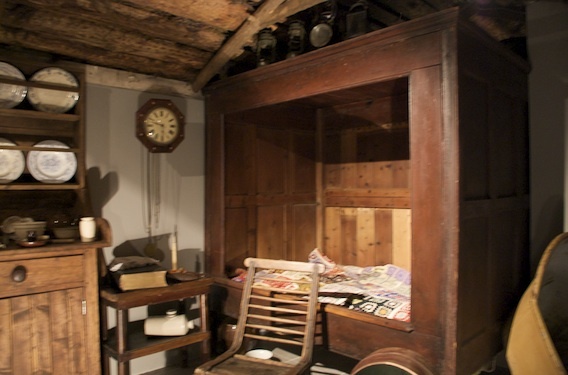 This had been the way for centuries, and the entire culture supported the rhythm of the family farm also called a croft. What was to come was large scale sheep farming, and to make room for these large flocks of sheep, the tenants had to be removed from their small farms dotting the countryside. This effort to change the use of the land gave rise to the “Highland Clearances”, of which so much has been written and told. The first clearance of Berriedale happened in the late 1700s, and focused on areas south of the Berriedale river. At this time, our Henderson ancestors were living in the somewhat idyllic enclave at Knockfin, and this action to clear the farms from the land must have been a life changing event. Clearly it was only a matter of time before the rest of Berriedale was cleared, and with it Knockfin. What happened next begs for more reasearch. 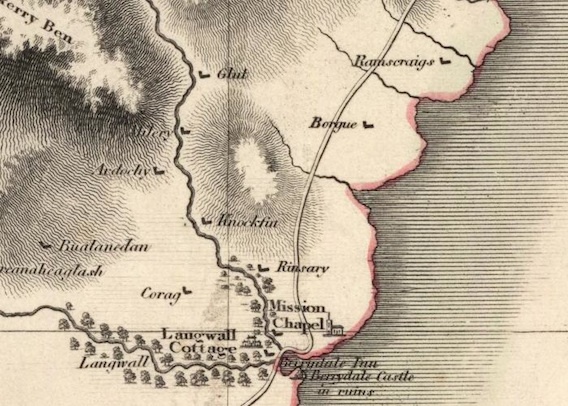 The historical records show that all of the Hendersons leave Knockfin between 1795 and 1801, with James taking up residence at Rhian replacing a fellow by the name of Grant who held the lease before him. 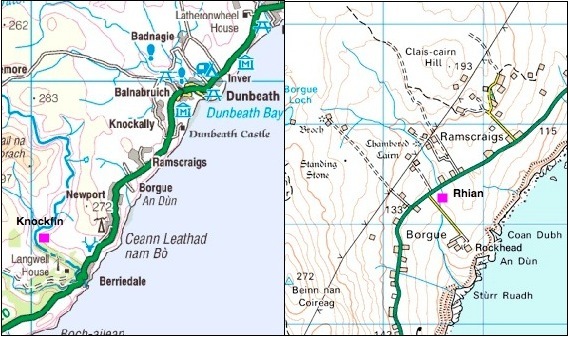 Parish birth records show that at least 2 Sutherland families remained at Rhian up until the clearances, but it is clear that James and his brothers left before they were told to leave. 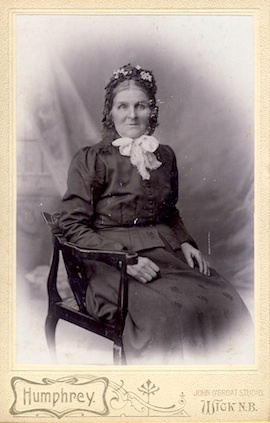 James worked as a farm hand for the Berriedale estate during his early adulthood, and eventually met Mary Sutherland who lived just north of Berriedale in Borgue. They fell in love, and on February 12th of 1799, they were married in Berriedale according to the rights and practices of the Church of Scotland. It is possible that there were other children born (research continues on the old parish records) to this family that died young or were not born alive. 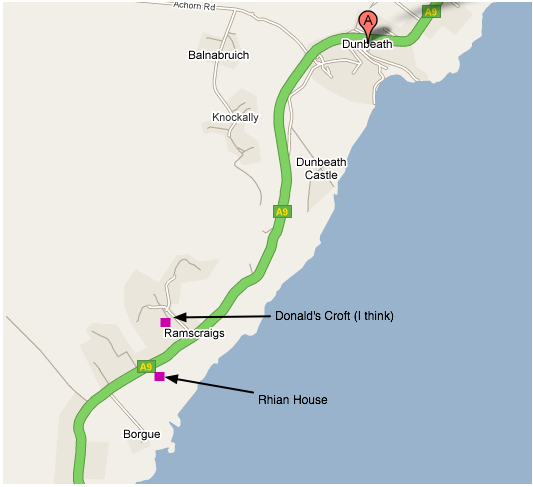 Of these 7 children, all would remain in the area around Berriedale and Dunbeath during their lives. During this period of time, the fishing industry in Caithness was beginning to ramp up. In large towns such as Thurso and Wick, as well as smaller villages such as Dunbeath, an increasing amount of the community’s income was derived from drift net fishing of Herring and Salmon. The family lived in a traditional, thatched roof Caithness longhouse. A typical rush thatched Caithness long-house incorporating dwelling, byre and stable into a single structure, with some crofts (such as the house at Rhian) having and additional free-standing barn (the structure shown in the photo). The Rhian croft house was built to traditional Caithness design: two rooms with fireplaces situated at either end of the building with a closet or unheated bedroom in the middle opposite the front entrance passage. All, or most, of the partitions were formed by the backs or end of box beds. Some of the houses did not have a central stone built gable. The name of Henderson is one long associated with the greatness of Scotland. Unique from most clans, the name came into being is several distinct areas by different means. In the far north of Scotland, in the isolated county of Caithness, the name Henderson came into being as the result of a bloody battle in 1478. 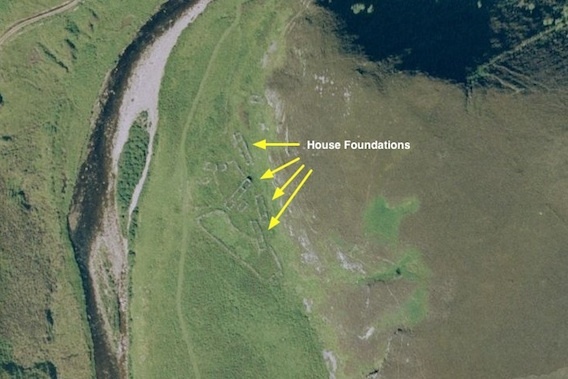 History tells that the Hendersons of Caithness were once a part of the ancient clan Gunn. The Gunns came to Scotland as stewards of the northern counties, that were at one point under the control of the viking Jarls of Orkney. The Gunns helped to manage Caithness and parts of Sutherland and established themselves over the decades and prospered. When the northern territories were ceded to Scotland, many of the norse families, including the Gunns, who had been living there decided to remain and become citizens of the Scottish crown. The Gunns had several fierce rivalries with neighboring clans, with the most bitter being with another ancient family of the north, the Keiths. Throughout the 1400’s, the Gunns struggled to protect their lands from incursion and the ever escalating revenge attacks for some ancient wrong that were returned in kind between the clans. In a bid to set aside their feud with the Keiths, George Gunn, who held the title of “Crowner” (the enforcer and sheriff for the Sinclair Caithness earl) offered a peace summit at a neutral location on holy ground. Both clans agreed that the chiefs would come escorted by “twelve horse” of each clan at the chapel of St. Tears (St. Tayre) on the coast north of Wick. The Gunns arrived first with 12 men consisting of his sons and his finest fighters and entered the chapel to pray. A short time later the Keith party arrived with 2 men astride each horse and proceeded to slaughter every Gunn inside the chapel. Several of the Crowner’s sons escaped, leaving their father and kinsmen butchered at the altar. The Keiths took the chief’s armor, his weapons and the enormous brooch that he wore as a badge of office to the earl of Caithness, and retreated to their castle at Dirlot. Beaten and bloodied but thirsty for vengeance, the chief’s 3rd son, Henry, roused a few men still fit to fight and approached Dirlot that very night. The Gunns found the Keiths in full celebration quaffing great drafts of ale. Henry drew back on his bow and let fly an arrow which found its mark in the throat of the chief of Clan Keith. As he did so, he shouted in Gaelic, “Iomcharagnn Guinach gu Cadhaich,” which translates to, “A Gunn’s compliments to a Keith.” In the confusion that followed, many of the Keiths where slain and the weapons and brooch of the Crowner were recovered. In the aftermath of the battle, Henry and his men returned victorious to Gunn clan territory, having avenged the murder under truce of his father and the chief. In the days following, Henry Gunn donned his father’s armor, weapons and brooch and attempted to assume the chieftains role as well as the office of sheriff. The oldest surviving son, James, claimed ownership over the legacy and the title as his birth right. The division threatened to erupt into violence between large segments of the Gunn clan until Henry relented and surrendered his claims and the chief’s possessions to James, though it is sometimes told that Henry kept the Crowner’s brooch. On that day, Henry decided to remove himself and his kin from the Gunns, and never again take that name. When he departed, he took with him his children (both sons and daughters) and their families, along with his closest friends and kinsmen. They lived apart from their Gunn cousins though they always kept on friendly terms with them, but took a very neutral position on all clan rivalries, feuds and wars from that time on. Each of them took the name the “Sons of Henry” or as we know it today – Henderson. This site is dedicated to the hard work, determination and memories of all the brave Hendersons and Henderson kin who originated from the Berriedale, Ramscraigs and Dunbeath area of southern Caithness, Scotland. Without their foresight and perseverance, the family as it is today would not exist. My chapter of this story really gets underway in 2006, when, thanks to a business trip to the UK, for which I am forever indebted to Mr. Tony Gibson, I finally overcame whatever reservations I had and made contact with my Scottish kin. I spent one perfect, glorious day in East Kilbride talking and visiting the most wonderful people, whom I had only known of at a distance before then. Late in the day, my cousin, Lesley, handed me a two page document with a rough family tree printed on it. For various reasons, much of this information had been lost to us American cousins, and this knowledge was pure gold to me. My cousin Anthony had assembled it from what he knew and what information had come from his father, my father’s older brother James. Some of the names were familiar, some of them new to me. My knowledge went as far back as “the reverend” as he was called in our house, but here was the name of the reverend’s father – Donald, and beside it “Latheron, Scotland”. I had never heard of Latheron, when asked my scottish family told me it was “up north in Caithness”. From this foundation was launched an effort to learn what I could. It started small and simple at first, and grew outward. It transited from simply identifying the members of the family and the various relatives down the ages, but towards the history of Caithness, where they lived, how they lived and how they impacted the world around them. The effort has been a labor of love, but not my labor alone. As the project has progressed we have constantly collected Henderson cousins and kin, with a few more being found and joined to the project ever month or so. Thanks to all their efforts we have achieved more than I ever dreamed possible. This site now exists to help us record our knowledge for any and all who wish to learn it. Much of what you read here starts as emails between the cousins, where we reveal new information and discuss and enrich the detail in the telling. Welcome to Ramscraigs – the ancient home of our ancestors, we are glad you came by! The peat fire is blazing, and there is always another chair at the table.